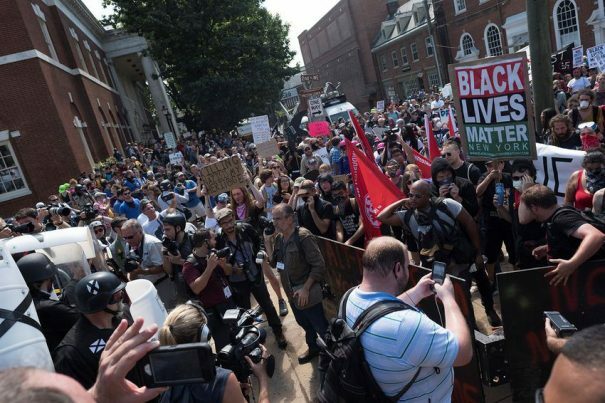 A “Unite the Right” rally in Charlottesville, Virginia, that led to violence after extremists from the ANTIFA and Black Lives Matter terrorist groups started provoking peaceful protesters and rioting in the streets is pretty much the only thing that the mainstream media has been talking about for several days now. But missing from the official narrative is any admission whatsoever that it was leftist loons who were responsible for escalating the situation and creating violence – not those who originally organized to protest the removal of treasured historical monuments. Despite the many unanswered questions and anomalies surrounding the Challenger incident, the mainstream media has been quick to decry it as a product of racism – some even going so far as to blame President Trump for “emboldening” violence. But the truth of the matter is that it was the left that provoked violence by disrespecting the free speech rights of those with whom they disagree. The day after the incident, Unite the Right rally organizer Jason Kessler attempted to give a press conference in front of City Hall to disavow himself from the violence. But during his speech, Kessler was assaulted by enraged BLM/ANTIFA activists who started to punch him and force him away from the podium, resulting in his having to be escorted away by police. “The denial of First Amendment rights … led to the political violence that happened yesterday,” Kessler announced to a sea of people chanting and booing before he was violently removed from the podium – all over the left’s intolerance for free speech other than its own. It’s a common characteristic of social justice warriors and white guilt crusaders who simply can’t stand the thought of other people who think differently from them having a voice in the world. Anything that anyone says that the leftists don’t like is automatically dubbed as “hatred” or “extremism,” a manipulative tactic used to silence dissent. This type of free speech muzzling doesn’t just happen on city streets and on college campuses, it’s important to remember. It’s now happening at places like Google, the search engine giant that recently fired an employee for raising concerns about the company’s double standard policies concerning political free speech. “Under the incessant burden of Left-wing tolerati who demand absolute obedience to nonsense social justice narratives, Google is rapidly collapsing into a cultural cesspool of oppression, witch hunts and gang-ups that target non-conformists,” says Mike Adams, the Health Ranger.